One of the things I love about the Bible is the story aspect of it. The characters are so diverse, the plots are so intricate, and the lessons learned are even more dynamic. Of those stories there is the one story that started it all, “The Garden of Eden.” It is in this story that the world changed forever, and the only other time such a change happened was the birth of Jesus. Still, there at the Garden, there is so much that meets the eye, so many angles to look, and so many lessons to be learned. For the sake of this post, we’ll look at one. The Devil still uses the same tricks as he did back in Eden today, because they still work. One of which is ungratefulness. Let’s just say, for example, there were 100 different trees in the garden. One hundred different trees, each with a different fruit or whatever element can grow on trees, and they were pretty too (Genesis 2:9). Looking at that alone, I can’t even name 50 different trees or the food that grows on them. 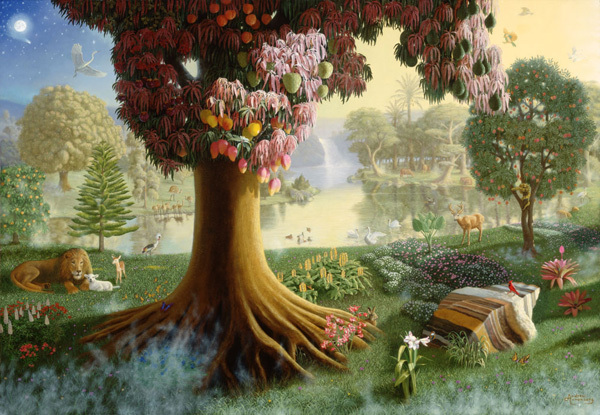 However, out of the 100, God specifically said don’t eat of one, the tree of the knowledge of good and evil (Genesis 2:17). Now, if Eve (since she was tricked first) would have realized that she already had access to the other 99 trees and would’ve been grateful with that fact alone, she wouldn’t have ate the one tree she wasn’t supposed to. Likewise, many people today, we lose sight of the many great blessings that we do have and the value in them. Then, in some way or another the Devil comes in and shifts our focus to the one thing that we don’t have and often don’t need, we lose sight and forget the blessings we already have, which is far more compared to what we don’t have. When the temptation or lust, if you want to call it, gets strong enough, we are led to do things we know we shouldn’t do and we many times compromise and we get ourselves into situations that God didn’t want us in in the first place. The lesson here is that God knows what’s best for us in our lives, and what’s best to fulfill our purpose. We don’t. We must be grateful always for what the Lord has blessed us with, be happy with those who God blesses as well (Romans 12:15), and remember what God has for us is for us.